Ben Sexton was originally drafted by the Western Bulldogs (then Footscray) who must have been impressed by the performance of Michael Sexton, Ben's older brother and Carlton star. Unfortunately for Ben his time at the Western Oval ended a few years later. Sexton played from 1991 to 1995, in this time he played 39 games and booted 32 goals. Ben was traded to Carlton for James Cook after the 1995 Premiership win, and was welcomed with open arms. It was clear that Carlton were hoping for another Sexton in Michael's mold. Instead, Ben played only 4 games, mostly in defence. However, he did kick a goal. 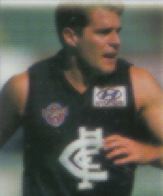 Another brother Stephen Sexton played at Carlton but only at reserves level in 1995. Ben was delisted after the 1996 season. Contributors to this page: Bombasheldon , pblue , molsey , tmd1 , dgreen2 , true_blue24 , WillowBlue and admin . Page last modified on Thursday 30 of May, 2013 20:38:51 AEST by Bombasheldon. 2003 - Angwin faces burglary charges (16/8/03).